The Gurdwara was founded by Mohammad Pasha Amoot follower of Peer Bakol at the time of visit of Guru Nanak's(1469 – 1539) visit to Baghdad in year 927 AH(1520-1 AD) where Guru Nanak Dev had arrived on way back from Mecca and Madina. Note: The gunmbud like dome on the sharine. It was built by a Sikh from Sikh regiment, during the World War-I that was stationed there for shikh, as their Gurdwara (worship place). Later on it was related to the tale of Mohammad Pasha Amoot follower of Peer Bakol Lodhi. 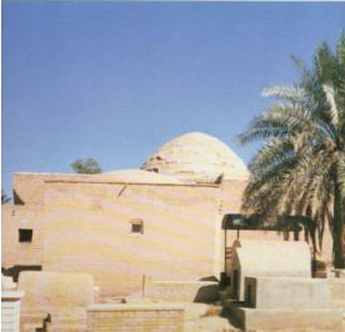 The Gurdwara was founded by Mohammad Pasha Amoot follower of Peer Bakol at the time of visit of Guru Nanak's visit to Baghdad in year 927 AH(1520-1 AD) where Guru Nanak Dev had arrived on way back from Mecca and Madina. It is said that Guru Nanak Dev stayed outside the city of the west of Dajala (Tigris) River, about two kilometers north of Baghdad West railway station. 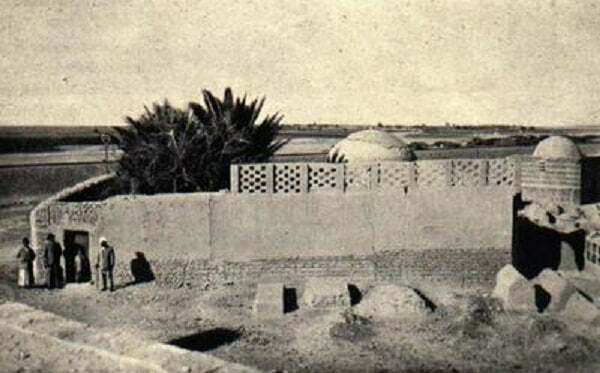 He held discourses with Sajjadanashins (caretaker of mausoleum) of the mausoleums of Abdul Qadir gilani and Bahlol the Wise, who were greatly impressed by his views on God and religion. After the Guru's departure, they raised a memorial in the form of a platform where the Guru had sat and discoursed. After some time when a room was constructed over the platform, a stone slab with the following inscription in Turki was installed in it: Lo ! the Great God hath fulfilled the wish. A new building for Baba Nanak Darvesh has been constructed. 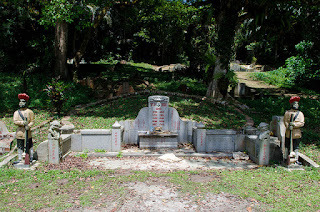 Seven holy men extended their help in the construction. Its date as reckoned comes to 927. The lucky disciple caused a new current of water from the earth. The last sentence is the customary phrase to work out the date according to alphabetical key. The date is 927 A.H. which correspond to A.D. 1520. This inscription was first noticed by "Swami Ananda charya" who mentioned it in his book "Snow Birds". Sikh soldiers who went to Iraq during the First World War, 1914-18, raised a Gurdwara here, but now only the room exists which is visited by Sikh and non-Sikh Punjabis who have gone to the oil-rich Iraq as workmen during decades. However, as it is located within the graveyard, visitors are banned from staying overnight, cooking meals, holding Langar and Kirtan in view of the sensitivities of the majority of Muslim community. 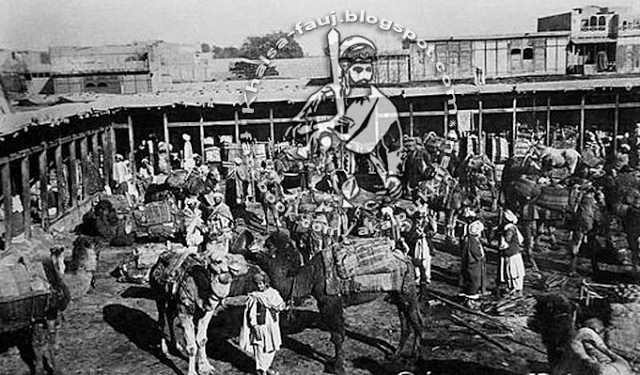 After having travelled to Madina, Guru Nanak Dev ji soon arrived in Baghdad and took up a position, along with Mardana, outside the city. Guru Nanak Dev ji shouted the call to prayer, on which the whole population became wrapt in silent astonishment – the Guru omitted the usual words Muhammad ar Rasul Allah, and substituted Arabic words of a similar sound to express his own ideas, hence the astonishment. Upon this the Guru began to repeat the Japji. The pir then called upon the Guru to give a manifestation of his power. Upon this, it is said, the Guru laid his hand on the high priest’s son and showed him the upper and lower regions described in the Japji. 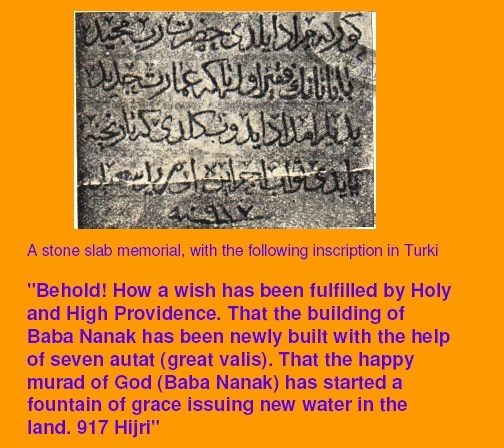 "In Guru, that is the divine sage Baba Nanak Fakir's commemoration, this monument has been rebuilt. The holy sage bestowed the spring of divine benediction in 927 Hijri, 1520/1 AD". 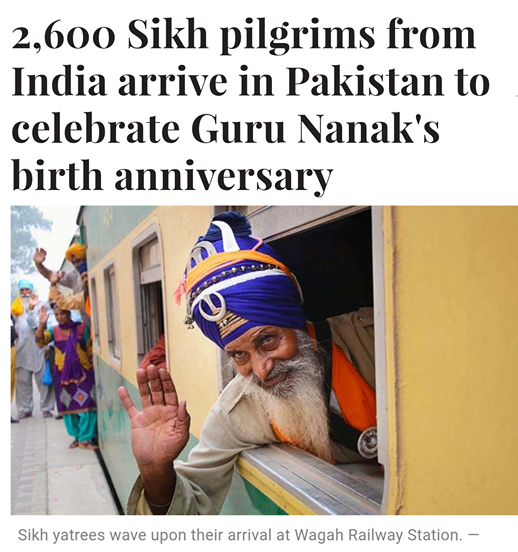 "Guru Nanak Dev. Ji's original painting." The painting is stated to have been made by Kamal-ud-din Behzad (1450-1535) of Tabriz, in Baghdad, IRAQ when he was returning from Haz on his way to Tabriz and accompanying Jiwan Qazi. 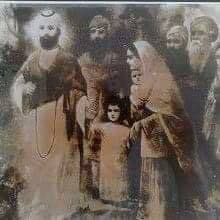 Almighty Satguru Nanak Sahib was in Baghdad from November 1519 to January 1520. Jiwan Qazi of Uch Multan Division, brought it to Multan in 1521 AD. The village Hassan Baba is located in The Valley of Temps, between Mount Olympus and Larissa. Sultan Selim-I: accompanied Almighty Satguru Nanak Sahib and Bhai Sahib Mardana Ji in 1520.Sultan Selim-I was the son of Sultan Bayzeid-II, who went to India in 1511 alongwith Pir Bahlol. This Sultan and Pir Bahlol were given night dinner at Lahore by Sultan Sikander Lodhi of Delhi. Daulat Khan Lodhi and Rai Bular attended the Dinner.Sultan Bayzeid-II told the congregation that The Pir Guru Nanak met them in Ajmer Sharif in Rajputana(Ref.Mughal Records, 1511). This Pir Bahlol died in Baghdad in 1511, and his disciples built a Memorial both of Pir Bahlol and Satguru Nanak Sahib's praise. This Sultan Selim -I accompanied Satguru Nanak Sahib. British Museum has obliged to give the portait of this famous disciple of Satguru Nanak Sahib. 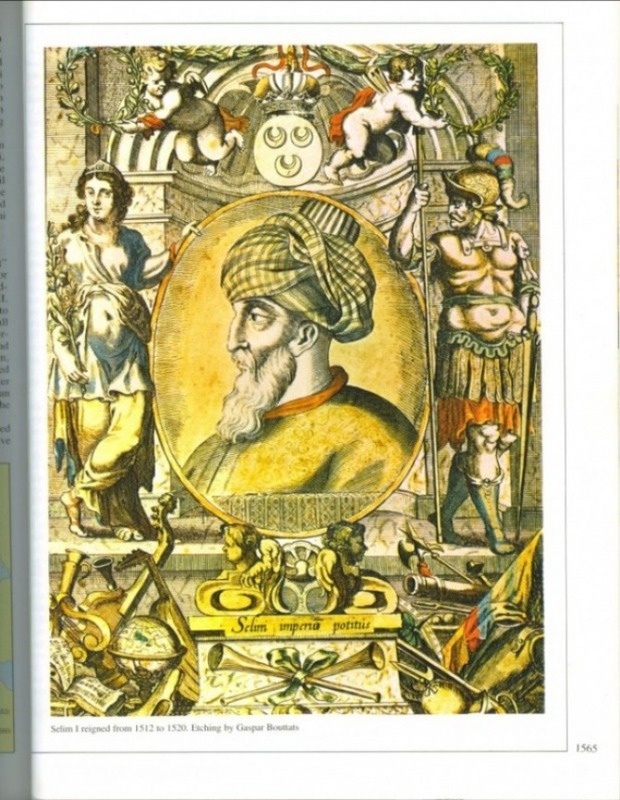 The son of this Sultan, Suleiman-II built a memorial in Istanbul( Turkey), which was detected by Prof. Davinder Singh Chahal. I am greatful to this learned Prof. for clicking this Sikh monument. 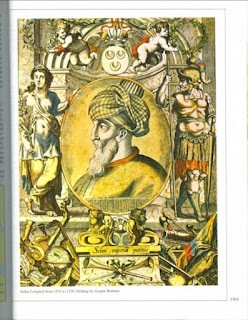 Sultan Selim-I, The First Caliph, died in September 1520, after the saparation from Satguru Nanak Sahib From Kastoria (Greece).His portrait was made on the request of Sultan Suleiyman-II, by his famous painter Gasper in 1565. Sultan Selim-I, The Disciple of Satguru Nanak Sahib. The real story goes like this. Japu vanshi of Multan went to Russia in early part of sixteenth century. Both Satguru Nanak Sahib and Bhai Sahib Mardana Ji went to third Oddessey ( Udhasi) in the north of the world in 1516-17. They visited Asthrakhan and stayed at the house of Japu Vanshi, a trader from Sukkur, Sindh ( Ref. Varan Bhai Gurdas, Var 11, Pauri 14), where Bhai Sahib writes---"Bhagat Jo Bhagata Ohri Japu Vanshi Sev Kamave--". At Astrakhan Satguru addressed the traders to do "Nek Kirat" (Fair trade) . Satguru spend some days with Japu-Vanshi and made him the Preacher of China, Korea and Japan etc. They left for Nanking and Shanghai (China), North Korea and Kobe ( Japan). In 1556 the Astrakhan was won by Russia. in 1556, the English traveller, A. Jenkinson went to Asthrakhan, who confirmed the Mangole trader, Iranian traders etc. Another traveller, S. Herberstein was of the different opinions. He ( S. Herberstein) Wrote"---the importance of Asthrakhan about 1520s, stating that ' Asthrakhan is a wealthy city, and the great emporium( Traders House) of the Tarters, which give its name to all surrounding country-----, being heirs of merchants, craftsmen, fishermen and farmers---"( Ref. PP No. 207 of " Islam in Russia"). In 1625 an Indian Serai was built in 1625, and an Indian Square was built by local govt. in 1649.There were traders in Moscow and Volga region of Russia even before 1580 ( Ref. " The Merchant of Moscovy 1580-1650). The Russian census in 1556 confirms some Indian traders in the south of Russia. Asthra Khan is in the south region of Russia and Volga river. in 1469 a Russian traveller, Afanasij Nikitin, reached India. He was a trader too. From 1469, the Indo- Russian trade started ( Ref. " Indian Dispora in Central Asia and its Trade, 1550-1900"). Gurdwara Sahib at Calmai Market or Principal Squre in Asthrakhan ( Russia). This is actually the first meeting of Zahiru-din-Mohammed Babur and the Prince Humanyun at the Ismail Mosque in Bukhara(Khurasan). Humanyun was about 14 years old at that time. Babur and the others came to the Mosque to read the Namaz in the evening in the month of Ramzan of 1520. Babur mentioned that he is said to be a Marad(Purakh) who takes wine, bhang and other intoxicants.But fearless Satguru made the defintion of "Marad" and uttered the two Saloks of Mardana -I here.This definition of "Marad" is again clarified by the fifth Nanak, Satguru Arjan Sahib as----"Soi Marad Marad Mardana ----" Holy Page 1084 of SGGS. 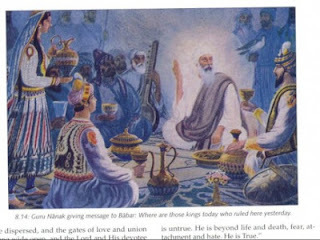 In these Holy Saloks ther Satguru clarifies that in this Kaliyug(Dark Age) the wine is being given the wrong ones.This painting is taken as a courtesy from"The Guru'S Word & Illustrated Sikh History by Dr. Santokh Singh, published by Spiritual awakening Studies,Princton, Ontario, Canada,2000. 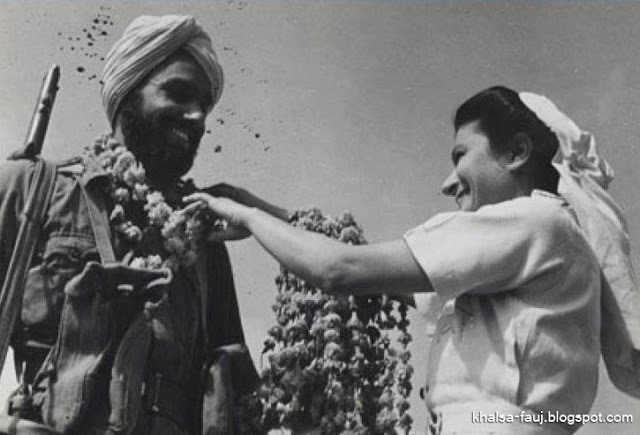 A Sikh soldier receiving a garland of flowers from a nurse, 1946. During the Second World war the Indian Army expanded to over two million troops, 300,000 of whom were Sikhs. This was probably the largest volunteer army in history. Indian troops served in Western Europe, East and North Africa, the Middle East, Italy and the Far East. They played a decisive role in winning the war. One of 233 official photographs collected by Captain Roy Wiltshire in his capacity as Editor of the Indian Army Review. The Sikh guard statues are a fine example of this, where the once living, then impressed with the diligence, loyalty and bravery of the Sikh guards brought in by the British colonial masters then to provide security, decided that they would also be adequate guardians of their final resting when they pass on.